The second season of the World League of American Football, the NFL’s Spring developmental league, concluded with the Sacramento Surge facing the Orlando Thunder in the World Bowl on June 6, 1992. Sacramento, coached by Kay Stephenson, topped the North American West Division with an 8-2 record. QB David Archer (pictured above), a veteran NFL backup, was the league’s top passer and WR Eddie Brown, a product of the CFL, topped the developmental circuit with 1011 yards on 48 catches, 12 of which were good for touchdowns. RB Mike Pringle, also from the CFL, was effective both running and catching the ball out of the backfield. The defense was anchored by DE Michael Sinclair, who recorded 10 sacks and would go on to become a Pro Bowl player for the Seahawks. The Surge edged Barcelona 17-15 in the first playoff round to advance to the World Bowl. The Thunder were coached by Galen Hall and also went 8-2 in finishing first in the North American East Division. QB Scott Mitchell was on loan from the Miami Dolphins and showed his potential by passing for 2213 yards, which ranked second in the league. WR Joe Johnson was the best of the receivers, while Darryl Clack, a disappointment with the Dallas Cowboys who had gone to Canada, was the best of the ground gainers. Orlando thrashed the Birmingham Fire by a score of 45-7 to qualify for the World Bowl. There were 43,759 fans in attendance for the Saturday night game at the Olympic Stadium in Montreal. Orlando took the early lead in the first quarter thanks to a 12-play, 98-yard drive that was helped along by penalties. Scott Mitchell capped the series with a 10-yard scoring pass to WR Chris Ford and Tracy Bennett added the extra point. Cary Blanchard kicked a 32-yard field goal at 4:16 into the second quarter to get the Surge on the board, but the Thunder got a break when Eddie Brown fumbled a punt inside his ten yard line. Mitchell threw to WR Willie Davis along the sideline for an eight-yard TD and Bennett’s successful point after made the score 14-3. With 54 seconds remaining in the half, Orlando’s Bennett added a 20-yard field goal to make it a 14-point margin, but the scoring wasn’t yet over when Archer threw to Brown for a 35-yard gain that set up a 24-yard Blanchard field goal with one second left on the clock. The tally stood at 17-6 in favor of Orlando at halftime. The third quarter was scoreless and Sacramento was still down by 11 points entering the final period, but the Surge narrowed the gap. Less than three minutes into the fourth quarter, David Archer threw to TE Paul Green for a 12-yard touchdown and then tossed a pass to WR Mark Stock for a two-point conversion that made it a 17-14 contest. The Surge had a chance to tie the score on their next possession, but Blanchard was wide on a 31-yard field goal attempt. However, Sacramento got the ball back on an interception of a Mitchell pass by LB Mike Jones, who returned it 12 yards to the Orlando 34. Archer tossed a screen pass to Mike Pringle that gained 31 yards to the three and three plays later, with 5:44 to play, Archer connected with Brown in the left corner of the end zone for a three-yard touchdown. Blanchard added the extra point, and that was it as the Surge held on for a 21-17 win and the Championship. The Surge significantly outgained Orlando (402 yards to 203) and had more first downs (24 to 15). Sacramento also led in turnovers with four, however, to three suffered by the Thunder. Each team recorded two sacks. David Archer completed 22 of 33 passes for 286 yards and the two fourth quarter touchdowns while giving up one interception. Mike Pringle rushed for 84 yards on 17 carries and caught two passes for 37 more yards. Eddie Brown topped the Sacramento receivers with 8 catches for 78 yards and included the game-winning TD. For the Thunder, Scott Mitchell was successful on 18 of 41 throws for 187 yards, also with two TDs and one interception. Joe Johnson had 7 pass receptions for 79 yards. The running game was practically nonexistent, with a total of just 35 yards on 11 attempts, and the individual leader was Darryl Clack, who gained 20 yards on 8 carries. The 1992 season marked the end for both Sacramento and Orlando as the league went on hiatus and, when it returned in ’95, it was based entirely in Europe. The CFL expanded to Sacramento and David Archer was that team’s quarterback. Mike Pringle also played for the CFL’s Sacramento club for a year before moving on to Baltimore, Montreal, and Edmonton in what ended up being a Hall of Fame career. He led the league in rushing six times and finished as the CFL’s career ground-gaining leader with 16,424 yards. Eddie Brown also continued on in Canada, catching 532 passes for 8663 yards and 60 TDs with six teams (he also had a brief hiatus in the Arena Football League). 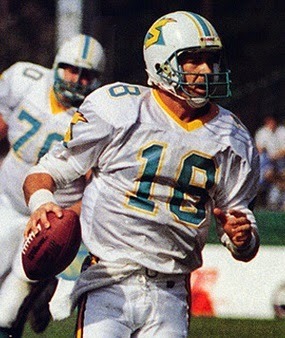 Scott Mitchell backed up Dan Marino in Miami for two seasons, performing well enough when starting in the place of the injured Marino in 1993 to gain a large free agent contract from the Lions. While he showed some flashes of ability, most notably in ’95 when he threw for 4338 yards and 32 TDs, his career ultimately failed to live up to that early promise.